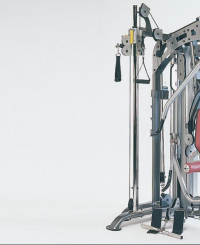 Fully adjustable, dual pivot points on the pectoral arms accommodate various arm lengths and helps the user maintain perfect form throughout the range of motion. "Off-the-floor" 3-point contact frame. Space efficient all-frontal design. "Off-the-floor" 3-point contact frame. Space efficient all-frontal design. 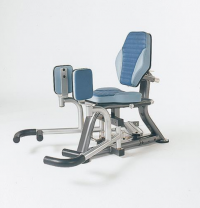 Trigger-release device provides quick & convenient press arm adjustments for chest, shoulder and mid-rows exercises. 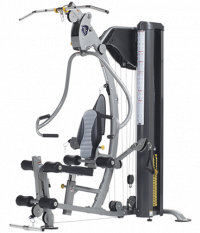 Traditional home gym platform providing full body machine based movements shown with option AXT-RIG Cable Outrigger station (MSRP: USD$379.00). Standard with 200 lbs. weight stack. 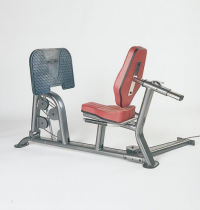 Combines popular functional training with traditional press arm and leg station offering the best of both worlds.